Start off your visit on the 5th (Wed): enjoy breathtaking views from Qutub Minar, then admire the natural beauty at Humayun's Tomb, then steep yourself in history at India Gate, and finally examine the collection at National Museum. On the 6th (Thu), you'll have a packed day of sightseeing: contemplate the long history of Red Fort (Lal Quila), then take in nature's colorful creations at Akshardham, and then contemplate in the serene atmosphere at Birla Mandir Temple (Lakshmi Narayan). 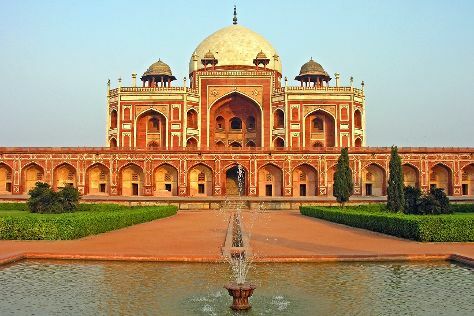 To see photos, reviews, and more tourist information, use the New Delhi travel itinerary planner . If you are flying in from India, the closest major airport is Indira Gandhi International Airport. June in New Delhi sees daily highs of 45°C and lows of 32°C at night. Finish your sightseeing early on the 7th (Fri) so you can travel to Pattaya. Start off your visit on the 7th (Fri): kick back and relax at Pattaya Beach and then kick back and relax at Jomtien Beach. Keep things going the next day: admire the striking features of The Sanctuary Of Truth (Prasat Sut Ja-Tum), then step off the mainland to explore Koh Lan (Coral Island), and then don't miss a visit to Walking Street Pattaya. For reviews, other places to visit, ratings, and other tourist information, go to the Pattaya road trip app . Getting from New Delhi to Pattaya by combination of flight and bus takes about 9.5 hours. Other options: fly; or drive. The time zone difference moving from India Standard Time (IST) to Indochina Time (ICT) is 1 hour. When traveling from New Delhi in June, plan for slightly colder days in Pattaya, with highs around 37°C, while nights are about the same with lows around 31°C. Cap off your sightseeing on the 8th (Sat) early enough to travel back home.